Fanuc Memory and GE Fanuc. Mazak Memory. Mitsubish 500, M Plus, T Plus, Yasnac MX1, MX2, MX3, LX1, LX2, LX3. YASNAC I80, MX1, MX2, MX3 and LX1, LX2, LX3 Memory Upgrades. MAZAK, MITSUBISHI 500, M Plus and T Plus too. FANUC MEMORY for A87L-0001-0015, A87L-0001-0016, A87L-0001-0017, A87L-0001-0018, A87L-0001-0084, A87L-0001-0085, A87L-0001-0086. Ask about Yasnac Memory MX1, 2 and 3 Memory, LX1 Memory and Yasnac I80 Memory upgrades. Deep Discounts on multiple CNC Memory Upgrade purchases. Until recently, increasing part program storage in your Fanuc CNC's meant great cost and bother. As most CNC's only have a minimum of part program storage, you may have been forced to split programs or continuously clear Memory. Not a very good solution, and extremely time consuming. Now there is an alternative. MCS can offer you a cost-effective, trouble-free answer to your FANUC memory problems. We have Fanuc Memory Kits. The Kits consist of Tested components, Applicable tools, a Manual and Software. 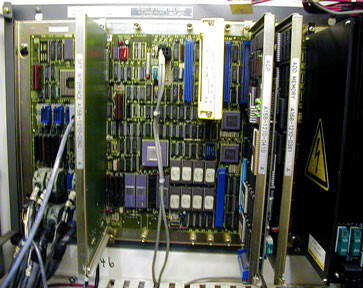 The Fanuc Series 15 requires the trade-in of your old BASE-0 board for a new upgraded one. (Note: always back-up your NC and PC parameters. Save up to 80% over OEM prices on Fanuc Parts. Great Resource Sits for CNC Machine Tool Parts. Allen Bradley 7300, 7320, 7340, 7360. Data Shuttle. Cool Program Shuttle. Yaskawa Yasnac i80 Control Memory Upgrade! FANUC MEMORY for A87L-0001-0015, A87L-0001-0016, A87L-0001-0017, A87L-0001-0018, A87L-0001-0084, A87L-0001-0085, A87L-0001-0086. Yasnac Memory MX1 Memory, LX1 Memory and Yasnac I80 Memory upgrades.